ProfBlog - Teacher Talk Blog | Helpers in the Classroom Capers office?!?! Teacher Talk Blog | Helpers in the Classroom Capers office?!?! Prof Blog | Gagnants du jeu concours ! ProfBlog | Mise à l’essai de modèles de Tampons Scolaires ! InfosProfs | Articles pour les fans de hiboux ! Helpers in the Classroom Capers office. 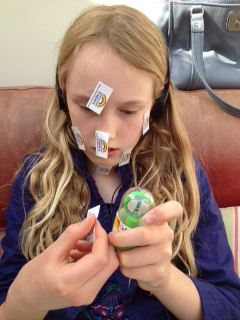 Just to prove we're a familiy classroom resources business, here's our daughter on an unexpected day off school 'helping with putting stickers on our school stamps. 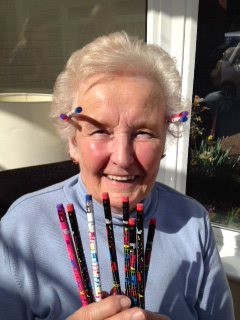 Not to be out done, Mum who's down for the day and so roped into making pencil packs felt the need to compete in the Friday funny photo competition! I think the sun has gone to their heads! ...I've just thought of a new name for her 'Pencil Packin' Mumma' !! (Should I be worried?!!?) Happy Sports Relief Friday everyone!